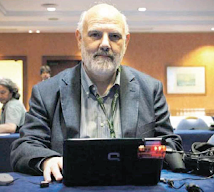 Well today it is very much "una de cal y otra de arena" as we say here in Spain (we could say "un pugno e una carezza" in Italian, but it isn't quite the same). First, the "carezza": Italian September consumer confidence unexpectedly rose this week. 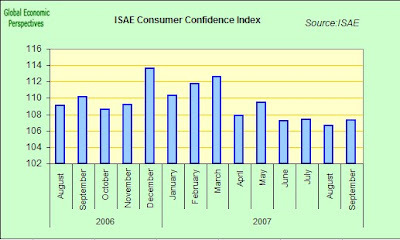 The Rome-based Isae Institute's index rose to 107.3 from 106.6 in August. But I don't think we can eak out too much pleasure from this single data point, since the reading is still well down on earlier in the year, and most of the other indicators are going in exactly the opposite direction, except unemployment, of course, but I have already addressed this apparent anomaly here. A more realistic sign of the times is to be found in the fact that the Italian government raised its debt forecast for next year at the same time as cutting its outlook for economic growth. Italy's debt is now projected to remain at 103.5 percent of gross domestic product next year, revised up from the original forecast of 103.2 percent. The figure was announced by Finance Minister Tommaso Padoa-Schioppa during a parliamentary session in Rome yesterday. He also suggested that he now expected the Italian economy to expand between 1.3 percent and 1.6 percent next year, lower than the original forecast of 1.9 percent. And from where I am sitting even this figure may well be too high, we need to see what happens this winter first. Italy's debt is still expected to fall to 105.1 percent of GDP this year, and the deficit to 2.5 percent of GDP, at least on Padoa-Schioppa's reading it is. But we still need to see the final actual growth performance this year before we can accept this type os assertion as realistic I think. Downside risk is everywhere right now, and the growth estimates have been dropping steadily since the spring. Now for the real shovel full of sand: Italian business confidence fell to the lowest in almost two years in September The Isae Institute's business confidence index fell to 92.2 from a revised 93.8 the last month. In fact the whole business sector seems to be taking a very differnt view of the situation from the official government one. The euro is at record highs, and everyone, with the horourable exception of Jean Claude Trichet it seems, is crying "ouch"
The Rome-based Eurispes research institute were already saying back at the end of August that the then 2 percent GDP growth forecast of the government was way too high and that growth - and remember that was then, not now - would be more like 1.7 percent this year. 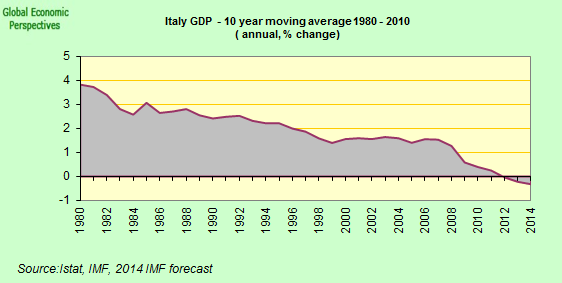 As I note above Finance Minister Tommaso Padoa-Schioppa yesterday said next year's growth will not top 1.6 percent, but we have yet to see a realistic complete 2007 GDP forecast from the Italian government (realistic I say, we can all try and pretend that what is happening isn't). To add more sand to sand, a measure of total orders in the ISAE index fell to minus 7 from minus 1 in August. Also a sub-index measuring domestic orders dropped to minus 9 from minus 4, while a measure of foreign orders remained stable at minus 7. Changing languages for a moment, and going back to the "pugno" (what was it Casius Clay said, "float like a butterfly, sting like a bee"?) is this all now ending up as a case of sauve qui peut?